*Oklahoma student Micah McDade had a little surprise in store for his high school graduation ceremony . 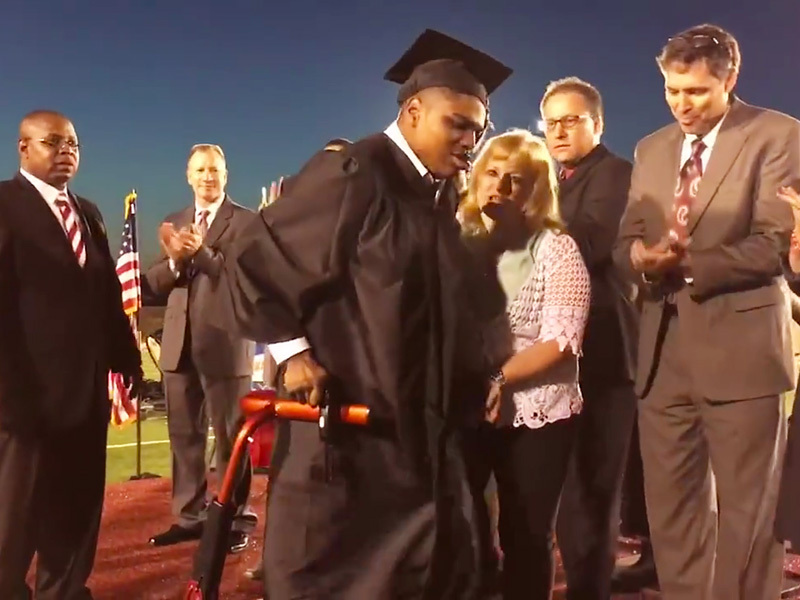 Born with cerebral palsy, McDade had always used a wheelchair to get around Okmulgee High School, but he practiced for months so he could shock his fellow grads by walking across the stage to receive his diploma, reports People.com. When McDade’s name was called at May 20 ceremony, he wheeled himself to the podium and slowly stood up from his wheelchair. The stunned Okmulgee, Oklahoma crowd cheered him on and gave him a standing ovation as he made his way across the stage, assisted only by a walker. McDade’s proud parents Mark and Anisa McDade were bawling. After settling back into his wheelchair, the graduation ceremony announcer recognized the heartwarming moment on the loud speaker.